With an extra man advantage and 1:28 left in overtime, Ryan Tierney sniped a pass through the teeth of the Massachusetts men’s lacrosse defense to Dylan McIntosh. McIntosh turned and fired a shot past goaltender Sean Sconone, and Hofstra came away with a 10-9 upset win over UMass on Saturday. The overtime defeat snapped UMass’ (7-4, 1-1 CAA) six-game win streak, and the Minutemen are now 0-3 this season in games that go to OT. UMass’ Tom Meyers won the overtime face off, but Hofstra (4-7, 1-1 CAA) goalie Bobby Casey stuffed Spencer’s attempt to curl from behind the cage and stick it in. Hofstra gained possession, Tierney found McIntosh on the other end after a costly holding penalty on Jackson Suboch, and the Pride came away victorious. It was a back-and-forth contest all afternoon, as UMass was never able to build itself a comfortable cushion. Hofstra initiated the scoring when Tierney assisted McIntosh for a strike at the 11:57 mark in the first quarter. A slashing infraction on the Pride’s Michael Altmann gave the Minutemen an extra man opportunity at the 8:10 mark, and they capitalized when Spencer set up an easy goal for Gabe Procyk to put UMass on the board. The Minutemen took a 6-4 lead into halftime, with Hofstra’s two goals in the second quarter both coming from attack Ryan Tierney. 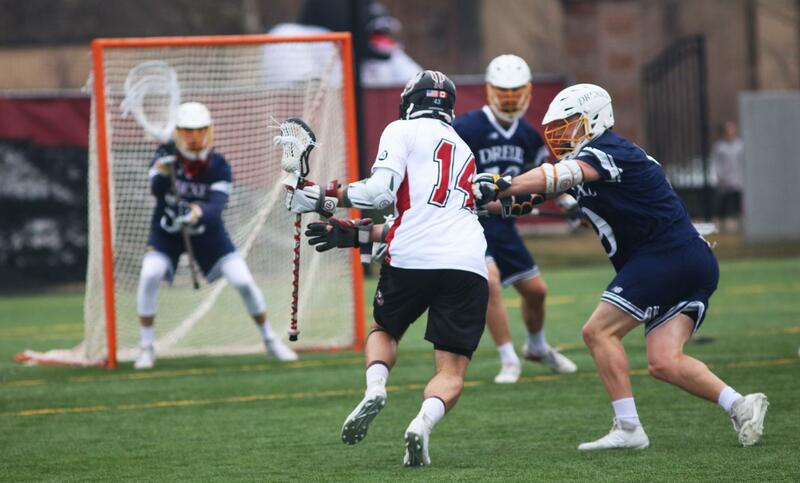 For his first goal of the second quarter, Tierney spun to his left to shake Jeff Trainor and free his hands for a strike on Sconone. His second strike of the quarter was a low-bouncing rip shot from the top of the offense, assisted by Nick Williams. Tierney was outstanding all game long, scoring six times and notching two assists. Hofstra briefly tied the game at six in the third quarter after scoring the first two goals of the second half. The latter resulted from a broken play which saw Tierney drop the ball, scoop it back up, then hit the right post with a shot that ricocheted to Riley Forte, who stuck it in. UMass had five turnovers in the third quarter, two of which came towards the very end of the quarter when Hofstra was able to strip Matt Hill twice as UMass worked to clear the ball. The Minutemen’s two unsuccessful clear attempts towards the end of the quarter gave Hofstra some momentum to carry into the fourth quarter. With an extra man opportunity just over two minutes into the fourth, Jeff Trainor plunged forward from the left side of the crease and stuck in a goal. With the goal, Jeff Trainor joined the 100-point club at UMass, making him the 42nd all-time member. Hofstra tied the game with 1:48 left in regulation following a Tierney goal, and the Pride had an opportunity to win the game after controlling possession with 30 seconds left. Tierney got a good look with about five seconds left on the clock, but Sconone made a clutch save, sending the game to overtime and giving UMass one last shot. The Minutemen will look to regroup when they travel to No. 12 Towson next Saturday in a heavyweight matchup that figures to be the CAA game of the year.